The proceedings for this conference were published by the IEEE Computer Society and hence are available on the IEEE Explore site. The Irish Machine Vision and Image Processing Conference, took place from the 2nd to the 4th of September 2009 in Trinity College, Dublin. 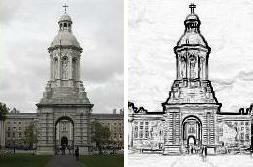 It was being jointly hosted by the Graphics, Vision and Visualisation group of the Department of Computer Science and by the Department of Electrical and Electronic Engineering, both in Trinity College Dublin, Ireland. IMVIP brings together theoreticians and practitioners, industrialists and academics, from the numerous related disciplines involved in the processing and analysis of image-based information. IMVIP 2009 was a single-track conference consisting of high quality previously unpublished contributed papers. The conference emphasised both theoretical research results and practical engineering experience in all areas. Full papers were subject to a double-blind review process by the programme committee. The programme included talks by two invited speakers. IMVIP 2009 was the 13th time this conference had been run. It is hosted annually by different universities on the island of Ireland. IMVIP 2009 was the main conference of the Irish Pattern Recognition and Classification Society (IPRCS), a member body of the International Association for Pattern Recognition (IAPR).